When you or a loved one is preparing for surgery, it can be a stressful time. You’ll probably have many questions and concerns: What is anesthesia? Is it safe? The first thing you should know is the staff and physicians at White River Anesthesia are available to answer any questions or concerns you might have. Our group of dedicated, experienced anesthesiologists and CRNAs work as a team with your surgeon to minimize pain and manange your care before, during and after surgery. Since each patient and situation is unique, we’ll tailor your anesthetic needs to your specific condition and surgical requirements. Secondly, due to advances in medical research, anesthesia has never been safer. While every medical procedure has its share of risks, loss of life related to anesthesia has dropped to an all time low. We’re here to answer all your questions, address your concerns and take you through your procedure with confidence. Don’t hesitate to contact us. Founded by Robert Blackshear, MD, White River Anesthesia Associates is made up of a team of 10 anesthesiologists and CRNAs with collective experience of over 200 years! At White River Anesthesia we’re committed to a common purpose: A team approach to compassionate care and excellent patient outcomes. 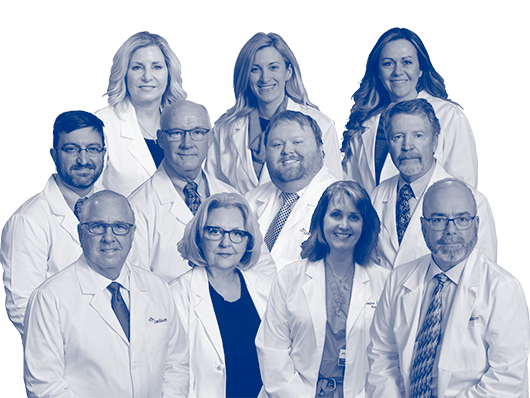 We encourage you to learn more about the staff and doctors at White River Anesthesia.